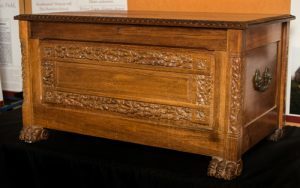 Dower chest carved 1937 for Viti Allardyce . Who was Nellie Payne? Dower chest for Viti Allardyce. Constance Viti Molesworth Allardyce was the daughter of Governor William Lamond Allardyce and Lady Constance Angel Allardyce (née Green). He was the Governor of the Falkland Island, Bahamas, Tasmania from 1920-1922 then Newfoundland. Viti was born in in 1896 in Suva, Fiji, hence her name. She came to Tasmania when her father was Governor and stayed here, before living in New Zealand with her friend Hatty Alexander from 1930-37 to study weaving. She married Lieut.-Colonel John F. Corlett of England on 19 May 1937 and it is believed that Nellie carved her dower chest for her wedding. After that she travelled to South Africa, Kashmir and Bombay from 1937 -1939. She then lived in Melbourne from 1939 – 1945 running an arts and craft shop at 66 Toorak Road with her friend Hatty Alexander. At some stage Viti moved to England and was living there in 1955. She remarried to Charles Woodward, followed by another marriage to Lieut. J.S. Mabutt. She also lived in Scotland. Viti did not have any children, and her dower chest was left to her sister Keva’s son and daughter in law. The Mercury (Hobart, Tas. : 1860 – 1954), Thursday 20 May 1937, page 11.